Cutting-edge technology allows you to upload a personal video. Select from several popular templates. Create a lasting memento of your special event. 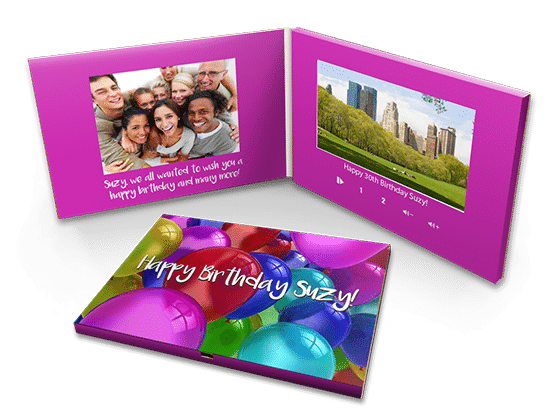 To create a unique and personalized Video Greeting Card, simply choose from one of our popular themes, such as birthday, wedding, or anniversary, easily change background colors, photos, and copy, upload one, two, or three videos, check our proof, and place your order. A personalized Video Greeting Card will show how much you care, and will create a lasting memento of your special event. To use our templates, begin by selecting a theme, then follow these three easy steps. Step 2: In the “Image Properties” menu, you can double click on any of the placeholder images and drop in your own photos. Step 3: In the “Text Properties” menu, you can click on the placeholder text and type in your own text. Both type fonts and colors can be easily changed to suit your own specifications. Once you have customized your Video Greeting Card, click the “Continue” button, name your design, and you will be automatically directed to the proofing page where you can proof your design and finalize your order. Remember, themes can easily change with new text or graphics. For example, if you like the balloon background in our Birthday theme, change “Happy Birthday” to “Congratulation” and this theme becomes a graduation greeting. If you’re creating a greeting for a young man, change the pink background to blue or use a school color. The only limits are your own imagination! Having difficulty recording professional-quality videos with your smartphone? The videos below, courtesy of Primal Video, will teach you how to get the most out of your device.